NASA will announce a new discovery by its Kepler planet-hunting telescope on Thursday (Sept. 15), in a press conference featuring astronomers and — oddly — a representative from Industrial Light & Magic (ILM). The announcement is scheduled for Thursday at 2 p.m. EDT (1800 GMT) and will broadcast and webcast live on NASA TV. The details of the new announcement are not yet public, beyond the fact that they relate to a Kepler finding set to be published in this week's edition of the journal Science. Kepler, an Earth-orbiting space observatory responsible for finding hundreds of alien planet candidates, was launched in March 2009. It searches for planets by looking for dips in stars' light caused by planets passing in front of them. The telescope's Holy Grail is to find an Earth-sized planet orbiting within the "habitable zone" of its star that would enable it to support liquid water, and possibly life. 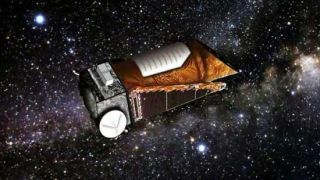 "Although additional observations will be needed to achieve that milestone, Kepler is detecting planets and planet candidates with a wide range of sizes and orbital distances to help us better understand our place in the galaxy," NASA officials wrote in a statement. Nick Gautier, Kepler project scientist, NASA's Jet Propulsion Laboratory, Pasadena, Calif.
Laurance Doyle, lead author, SETI Institute, Mountain View, Calif.
Greg Laughlin, professor for Astrophysics and Planetary Science, University of California, Santa Cruz, Calif. The event will be held at NASA's Ames Research Center in Moffett Field, Calif., and broadcast live on NASA TV.